Formal practice including bows, chanting and sitting meditation practices. Dharma talks monthly. Sentient beings are numberless. We vow to save them all. Delusions are endless. We vow to cut through them all. The teachings are infinite. We vow to learn them all. The Buddha Way is inconceivable. We vow to attain it. Prostrations are an extension of formal practice and yet another way to cut off all attachment to thinking and “just do it”. Prostrations could be likened to the ’emergency measure’ for clearing the mind. They are a very powerful technique for seeing the karma of a situation because both the body and the mind are involved. Bows are a gesture of humility. We do not bow to another, but rather in the face of the “other”. On the Buddhist altar is a figure of Buddha, this is the other. Bowing acknowledges the other, but not as something separate. The bow, and prostration come from the most profound depths of our aliveness. Chanting meditation means keeping a not-moving mind and the perception of the sound of your voice. Regular chanting makes our center stronger and stronger. With a strong center, we can control our feelings. When we are no more slave of our feelings and thoughts, we become free and independent. Sitting is very wonderful, but by itself it is not complete practice. It is easy to become self-absorbed and not even realize it. When we act together, then we can see the walls of self popping up as our mind reacts to what other people do and to what we do or are afraid of doing or are proud of what we’ve done. Chanting means acting together. It means listening to other people without judgment. It means supporting each other. It means acting completely, without hindrance and without self-delusion. It joins us to the sangha, the community. Chanting is meditation in action. We sit usually 30 minutes in the classical posture: legs crossed, back straight, eyes half open, the hands in mudra and natural breathing. Meditation is not really dependant on the form of the body, but rather on the way you keep your mind. You can stand up or use a chair, if your body hurts too much. During meditation we ask our selves without interruption the question: ‘What am I?’ When this question is sincere, thinking stops and ‘Don’t Know’ appears. ‘Don’t Know’ is the name of the mind before thinking. You can call this point mind, Buddha, God, Nature, the Absolute, Holiness, Energy or Consciousness, but originally this point has no name or form. Cutting all thinking and returning to ‘Don’t Know Mind’, you return to your true nature. Our true nature is like a mirror. You become One with the situation you are living. When the lights are red, you stop. When the lights are green, you go. 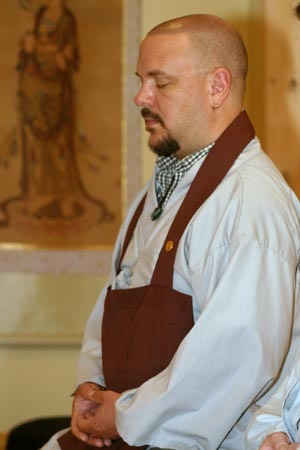 Soen Yu is a type of Chi exercise that is used in Kwan Um Zen School to help students with their Zen practice by keeping their minds centered. Soen Yu was developed by Zen Master Seung Sahn in the early 1980’s based on his own experimentation and knowledge of Taoist breath exercises. It was passed on from his students by personal instruction.